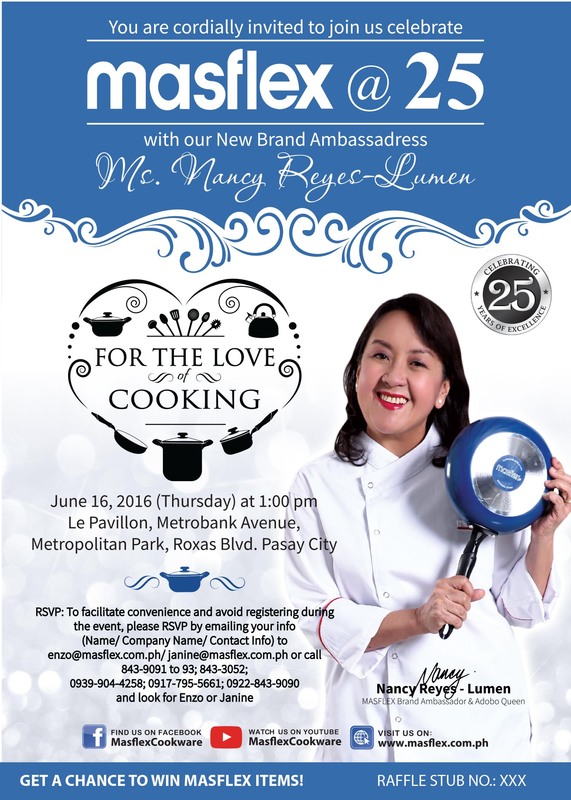 Last June 16, 2016 at the Le Pavillon Pasay City, Masflex Cookware celebrated its 25th anniversary of product innovation and excellence and launched its official brand ambassadress, Ms. Nancy Reyes-Lumen. Watch the video and see fun during the momentous event of Masflex Cookware and Kitchenware. The MASFLEX brand was first introduced in the Philippines in 1989 as a cookware brand. Back in the 1980s there were limited options for Filipinos for cookware, houseware, and kitchenware products. Either they were forced to buy very expensive global brands which majority couldn’t afford; or the other option was to deal with the lower-quality locally-made recycled scrap material cookware that posed a health risk. Due to these extremes in the market, there was a need for a range of affordable products that still had a standard of quality that would meet the needs of the Filipino homemaker during those times. The MASFLEX name was derived with the goal of finding market solutions to these problems. This is why it’s called MASFLEX. MAS was for the Mass Market segment that they were trying to reach out to and help, given the consumers were faced with difficulties in this product category. FLEX was derived from the word Flexible which was what the brand was trying to achieve; flexibility in terms of providing innovative solutions that were both affordable and of good quality for the Philippine market. For the past 25 years, MASFLEX has been successful in being the primary mover in almost all categories it is a part of. The brand is currently strongly positioned in the houseware, cookware, and kitchenware industry in the Philippines. Not only does the brand cater to the needs of the market but it also brings forth new and innovative technological solutions in the cookware industry. The MASFLEX Non-Stick collection encompasses all kinds of cookware, from basic non-stick cookware up to higher end forged aluminum cookware with non-stick coatings from Daikin Japan such as Ceramic, Marble, & Stone. Its latest addition is the Diamond Coating series that is made in Korea. The MASFLEX high quality Stainless Steel collection has both the basic and the premium lines of cookware. Other than cookware, Masflex also caters to a variety of kitchenware & houseware products attuned to the needs of the modern home makers. MASFLEX aims to continuously develop affordable, easy-to-use, and high quality kitchen and dining products for their loyal consumer base and further attract new home-makers towards using MASFLEX products in their homes and kitchens. Due to this the brand is currently enjoying continuous growth. A market leader that is headstrong in exploiting market gaps & white spaces and working on providing the necessary innovative market solutions for such. All for the Love of Cooking! MASFLEX is very proud to have their latest brand endorser, MS NANCY REYES-LUMEN, as their first ambassadress for the brand as part of their 25th year anniversary celebrations. In the search for an endorser for MASFLEX, they wanted someone who has had many years of experience in the culinary industry, has genuine passion in food and cooking, and one who can easily relate with the wide demographic base of consumers. They found this all squarely in the Adobo Queen who has also been an endorser for other food and appliance related brands. Not only is Ms. Nancy a home-maker, she is also a grandmother, mother, daughter, sister, aunt, multi-media personality, singer, band member, home cook, restaurateur, commissary operator, food writer, editor, food stylist, food show host, lecturer, Filipino food advocate, healthy food advocate, food researcher and a true blue cook. Ms. Nancy Reyes-Lumen also comes from the Reyes clan who is the most renowned family when it comes to Filipino food in this country. According to MASFLEX executives, what sweetened it further was the fact that she was already a loyal user of Masflex cookware and kitchenware products so she already knew the products very well.